“Choke me next!! !” lol just posing with some halloween studs/studette! For me, U-KISS are the best role models. Indirectly, they’ve taught me that in order to reach your dream, no matter how difficult it is, how much you must suffer or how many times you fall along the way, you must always try your best, put in all your effort and never give up. It’s hard to please everyone, but one day you’ll be able to reach the goal you’ve been waiting and hoping for. Most importantly, they taught me that through hard work, dreams can become reality. Watching U-KISS in their current state, it really hurts my heart. Every single day, in all of their schedules they’re doing their best. They’re working hard to please their fans and win the hearts of Korea. A lot of them are sick or injured right now, yet they act as if it doesn’t affect them during performances. They try to hide their worries and miseries from their fans. I know that deep down they’re hurting so much because it’s hard to believe that after years of hard work they’ve gained almost nothing. The reason why I want them to win is not so I can tell everyone the group I love the most has won an award and they’re not ‘losers’, but because of their very own feelings. Isn’t it obvious? They feel troubled from all of this. The standard for this album and title song was set high even before its release and now they’re scared they still might not make it to the top. They’re determined to win from their own hard work, but they can’t do it alone. I want them to win so they’ll feel content with themselves, so they can just be happy and feel as if they haven’t wasted 3 years of their lives. I especially want them to win so they don’t feel like they’ve been working towards nothing. 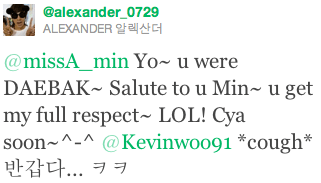 @alexander_0729 keke yeah~ nice meeting you! Pero dicen que uno crece segun el nombre que le ponen y nada me daria mas orgullo que tener un hijo como Yunho. Llevo poco viendo los secretos y la verdad unos son graciosos pero algunos son molestos ya que no solo se meten con las bandas si no tambien con las fans. Detesto Tanto que se peleen por que piensan que su grupo es el mejor todos absolutamente TODOS los grupos son asombrosos y tambien sus fans por ser tan dedicadas. Yuchun: Jae,dude,the camera is still rolling !! !